BROOKLYN, N.Y., Jan 29, 2018 (SEND2PRESS NEWSWIRE) — From an initial field of thousands of girls and young women from all over the East Coast, some 230 top point-scorers in divisions from elementary school through college and beyond, have earned their way to the finals of the 44th annual Colgate Women’s Games. Persevering through four preliminary meets and a semi finals at Pratt, these young Olympic hopefuls have emerged as some of the country’s finest athletic talent, with many scoring their personal best this season at the nation’s largest track and field series for women. Meet Director Cheryl Toussaint thanked all of this year’s participants, coaches and parents while reminding them of the goals of the long-running, much celebrated series. “The Colgate Women’s Games encourages young people to strive to challenge themselves in an atmosphere of friendly competition as a means to empower them with self-esteem that will last a lifetime,” she said. “To all coaches, parents and friends, thank you for your incredible selfless efforts to get to Pratt through all types of weather, some from great distances throughout the series. Each of you make a tremendous contribution toward a more positive future for those you encourage and support. We hope you have enjoyed every minute of your experience,” she said. In the High School Division, Iantha Wright of Queens won the 55M in 7.31; and Sophia Myers also of Queens had a perfect series in the 55M hurdles with her win in 8.21. In the 200M, Maya Cheatham of Queens won the 200M in 25.69, just ahead of Brianna White of Manhattan who finished second in 25.86. In the 400M, Jasmine Douglas-Grant of Stroudsburg, PA crossed the tape first in 58.11, with Brooklyn’s Daniella Griffith second in 58.85; both ladies’ best races of the series. Athing Mu of Trenton, NJ won the 800M in 2:16.78; and London Claxton of Peekskill, NY won the 1500M in 4:51.28.
Colgate Women’s Games’ Mid School High Jump record holder (5’61/2″), My’Khiyah Williams of Brooklyn, wowed the crowd by clearing the bar at 5’7″, tying her personal best jump; and Daniella Hull of West Orange, NJ won the Shot Put with a toss of 11.71M for the win over leader Mariam Chase of Manhattan who finished undefeated with a toss of 10.89M. In highlights of the Elementary A division, Alyssa Durant who travels all the way from Boston, dominated the series in the high jump, and finished strong clearing the bar at 3’10” her best jump of the series. Paige Sheppard of Scotch Plains, NJ, also had a perfect season in the 800M finishing in 2:45.78. Paige has also won first place in several major northeastern meets in sprints, middle and distance races throughout 2017. In highlights of the Elementary B division, two young champions who battled each other in sprints throughout the series, both won first place on Saturday. Philadelphia’s Amirah Nesmith, last year’s A division 200M finals champion, won the 55M in 8.11; and Brooklyn’s Kaela Swift won the 200M in 28.7, her fastest time of the year, and a new personal record. Complete results for all six divisions; Elementary A & B, Mid School, High School, College/Open and 30’s plus are available at colgategames.com; as well as a list of finalists who will compete at the New Balance Track and Field Center at the Armory, NYC on Saturday February 10, 2018, where trophies and educational grants-in-aid from Colgate-Palmolive Company are awarded to top place finishers in each grade division. The Games’ goal is also about the importance of continued education. All finalists in grade divisions must submit their attendance records, and an essay to the meet director to be eligible to compete. The essay topic will appear online by Friday, February 4, 2018. The Colgate Women’s Games boast more than 26 Olympians, hundreds of age/grade division national champions, and countless changed lives. Each year, high school participants are among the most heavily recruited athletes by colleges and universities across the nation. Coaches, recruiters, athletes and fans can follow scores each week at Colgategames.com. The finals of the 44th annual Colgate Women’s Games will take place on Saturday, February, 10, 2018 at the New Balance Track and Field Center at the Armory, NYC. 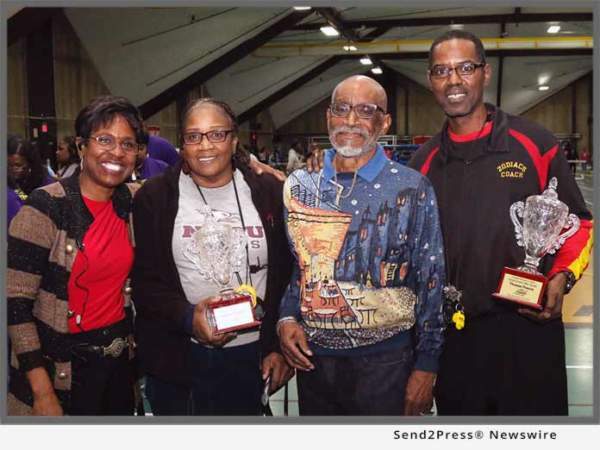 * PHOTO CAPTION: (L to R) Meet Director Cheryl Toussaint with Queen’s Metro Eagles Track Club coach Rhanda Hopkins, Colgate Games’ founder Fred Thompson and Bronx Zodiacs Track Club coach Thomas Francis. Hopkins and Francis were both named Coach of the Year for their tireless commitment to serving youth track and field. The pair have produced many of the nation’s top leaders over decades, and have shaped countless young lives for future success.